"Mr. Spock, you're aware of the orders regarding any contact with Talos IV. You have deliberately invited the death penalty. You've not only finished yourself, Spock, but you've finished your captain as well." 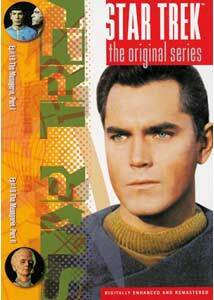 The original pilot for Star Trek was called The Cage and featured Jeffrey Hunter as Captain Christopher Pike. The Cage was not successful as a pilot, although it did garner creator Gene Roddenberry the opportunity to retool the show and try again with more success, as characters were discarded and actors were switched. Pike became Kirk and a young Canadian actor, William Shatner, replaced the more well-known Jeffrey Hunter. The look of the show got an overhaul as the B-movie, science fiction style of The Cage gave way to a sleeker, more "modern" look. The only character that survived from the original to the second pilot (Where No Man Has Gone Before) was a slightly altered (and less effusive) Mr. Spock. The first officer of the Enterprise in the first was, surprisingly for the times, a woman called "Number One," portrayed by Majel Barrett, who would later become Nurse Chapel on the series. The Mr. Spock that became familiar to viewers on the series was somewhat of a combination of Number One and the junior officer Spock that we see in the pilot. Once the show was on the air as a series, they decided to recycle the footage of the first pilot as a flashback sequence in a two-part episode called The Menagerie, focusing on Spock as the one character common to both. A framing story was created in which Spock fakes a message from a Star Base, requiring the return of the Enterprise. This is one of the difficulties for the story, as it is well explicated throughout the series that Vulcans cannot—not do not, but cannot—lie. In fact, this trait of the Enterprise's first officer is a fulcrum on which more than one subsequent episode swings. However, this can be justified, to a degree, with the idea that Spock can "bend" the truth when the needs of the mission require him to, as he also does in subsequent episodes. Captain Pike is identified as the previous Captain of the Enterprise who has recently, in the new story, been involved in an accident that has virtually destroyed his body and forced him into a motorized chair. Unable to speak, he communicates by using his mind to beep a light on the chair: once for yes; twice for no. This is another problem point. The device eliminates the need for an actor to portray Pike, but the difficulty they express with getting information from the handicapped Captain seems silly to anyone who has ever played 20 questions. In faking the message from the Star Base, Spock has created a plan by which he will kidnap Captain Pike and take him to planet Talos IV. This planet is the only place that Star Fleet has put on the books as forbidden, with a penalty of death for anyone who communicates with or visits it. Well, this is problem number three, in that it is just plain dumb. I suppose the device is necessary to provide a reason for Spock to fear the consequences of his act and allow the framing story of his court martial, in which he is able to show the footage from the original pilot as his evidence. Certainly the Enterprise was to eventually encounter aliens whose powers far exceeded the capabilities of the denizens of Talos IV and Star Fleet would have much more incentive to prevent contact. Anyway, Spock assumes command of the Enterprise and programs the computer to navigate to the forbidden planet. When Kirk finds that his ship has warped out of orbit, he follows in a shuttlecraft accompanied by Commodore Mendez (Malachi Throne). Travelling under radio silence, due to secret orders, the crew is confused by Spock's actions, particularly Dr. McCoy, who wonders who could possibly be aboard a shuttlecraft coming from the Star Base they had just left. Refusing to give up the pursuit, Kirk takes his small craft beyond the point of having enough fuel to safely return to the Star Base. When Spock calculates this fact, he orders the Enterprise to pick up the shuttlecraft and hands himself over to Dr. McCoy for arrest on a charge of mutiny. Kirk and Mendez board the ship and Spock immediately pleads guilty to all charges and demands a summary court martial. Mendez refuses, pointing out that such a court must contain three officers of command rank, and he and Kirk are the only two available. Spock in turn points out that there are, indeed, three officers of command rank, as Captain Pike was still an active duty officer. Realizing that Spock has somehow maneuvered them into a course but not understanding why, Mendez then makes a verbal blunder by asking Spock "why he was doing what he was doing" in the hearing. This opens the door for Spock to introduce the video footage that purported to show the experiences of Captain Pike on Talos IV, 15 years past. Even though there are problems with the logic and substance of the framing story portraying the court martial, this episode garnered Star Trek its first Hugo Award (given annually by the World Science Fiction Society) in 1967, as best Dramatic Presentation. One can only decide that the reason for this award is the compelling nature of the flashback sequences rather than the more mundane, although ingeniously conceived, court martial part of the story. The Cage has since been restored and released as an episode, appearing on Volume 40 of The Original Series collection as episodes 1 and 99. In the case of The Menagerie, one must be divorced from the original conception of the show and see it within its frame as evidence that Spock provides to justify his "mutiny and kidnapping." The flashback sequences are compelling but, ultimately, the whole thing does not hang together on close inspection. I found myself wondering what Spock was really intending to show in this retelling of his earlier adventure. How did this "evidence" justify his actions? As much as I enjoyed the flashback sequences, I found myself annoyed with the framing story, although this was not the case on my original viewing: I remember this episode making a big impression on me in its view of the past (our future) from the present (the distant future). I believe this to be one of the compelling aspects of the new Enterprise series currently running on syndication. The biggest weakness of The Menagerie is the lightweight nature of the framing story. On the other hand, the performances of Susan Oliver as Vina (whose visage as the Orion slave girl was a staple of Star Trek publicity shots) and Hunter, as Pike, provided a depth of acting that Star Trek rarely achieved. This is particularly true when played against the colorless action of the surrounding story. The original Star Trek pilot, while not what Roddenberry could sell to the network as a seres, still stands as a tribute to that era of action-oriented, science fiction from the 1950s that was born from the pulp novels of the 30s and 40s. Cast Notes: Jeffrey Hunter was in the midst of an inexplicable career downturn when he agreed to play Pike. Following his succes in The Searchers and an appearance as Jesus in King of Kings, he had difficulty obtaining work in Hollywood and ended up in various B-films and foreign productions until his death in 1969, following an accident while filming Viva America! in Spain. Susan Oliver was a familiar face on television for four decades, making appearances on a long list of the top series. Malachi Throne is another familiar face to television viewers of the 60s and 70s. He made a return to television in the 1990s with an appearance on Star Trek: The Next Generation, in the two-part episode, Unification, as Romulan Senator Pardek, which also featured an appearance by Leonard Nimoy, reprising his Spock character. John Hoyt (Dr. Philip Boyce) was one of a long list of actors and crew who worked on the film The Conqueror in 1956, who happened to die from cancer some years later, including John Wayne, Susan Hayward, Agnes Moorhead, and Pedro Armendariz. Hoyt appeared in such films as Julius Caesar (1953), Blackboard Jungle (1955), Spartacus (1960), Cleopatra (1963), Flesh Gordon (1972), and Desperately Seeking Susan (1985), and spent five years as Grandpa Kanisky on the TV series Gimme a Break! With a more logical framing story, this two-part episode could perhaps be called the first Star Trek movie and rate the maximum number of Enterprises. However, as it stands, I must give this one only two Enterprises, with a recommendation to watch The Cage to truly experience the parts that are best about it. Image Transfer Review: Typically fine transfers on these discs give us an excellent visual experience of these episodes. People are the point in both shows on this disc, thus we get beautifully rendered, colorful costumes and realistic skin tones. The footage from The Cage is excellently displayed and has a certain depth that reveals some of the aspects of "acceptable" series television in the 1960s. In retrospect, the content of the original pilot was too good for TV and not enough for a movie�the reverse curse of most of the big screen Star Trek presentations. Audio Transfer Review: The Dolby Digital 5.1 mix provides nice stereo separations on some aspects of this episode. The less than dynamic story does not lend itself to audio enhancement, being little more than "let's go to the videotape." But sections fromThe Cage do have some interesting aural effects. Extras Review: Extras? Yes, this episode deserved some, and no, it doesn't have any. It is the same old trailers and little booklet. The best part of this disc can be found on another volume, as the The Menagerie is a less-than-satisfactory framing story that recycles footage from the original Star Trek pilot as flashback material in Mr. Spock's court martial. Better to watch The Cage as a standalone story and leave off the lackluster and illogical plotline that was fine in its day, but simply doesn't hold up.